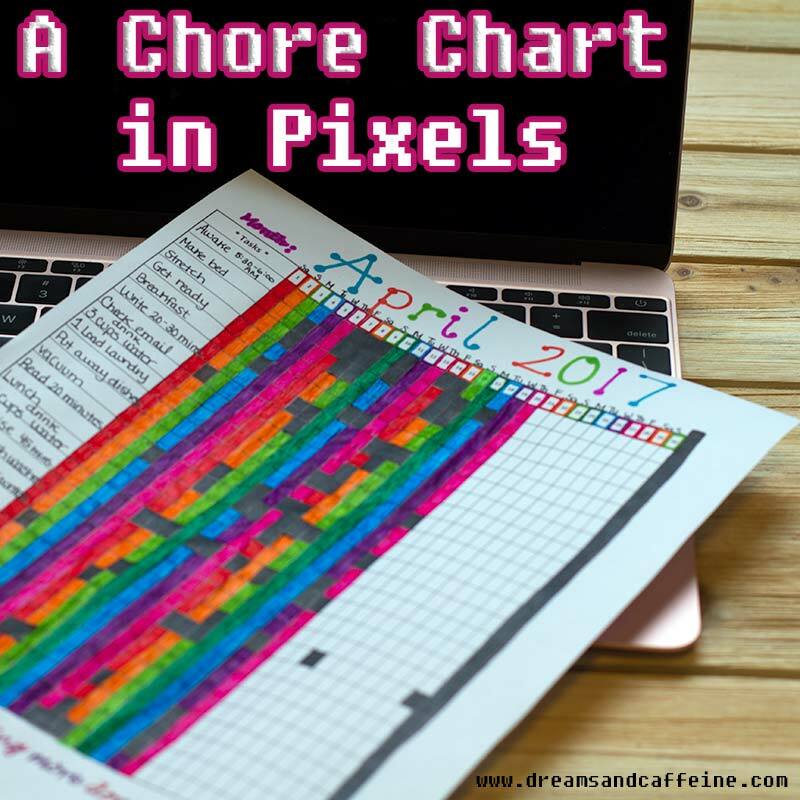 Let’s start with the obvious question of, what in the world is a Chore Chart in Pixels? And, why do you need one? I will be the first to admit that it took a little adjustment period for me going from a full time working mom to a stay at home mom to two under two. Especially because becoming a stay at home mom wasn’t planned and to top it off, our lives were in the middle of some pretty large transitions. Long story short, the child development center that I ran decided to shut its doors permanently, our daughter was about a year and half old and I was eight months pregnant. Talk about a time of chaos! After my husband and I decided this was the perfect opportunity for me to stay at home and raise our kiddos, I realized I had no idea how to be a stay at home wife and mother. I can just hear the gasps from all the Martha Stewarts and June Cleavers out there (my mother included). However, neither housekeeping nor cooking have ever been something I wanted to do, something I was good at, or something I strived to do. On top of that, having two young kiddos to care for was quite overwhelming. I have always had a love affair with planners, pretty paper, pens, markers, and stickers! 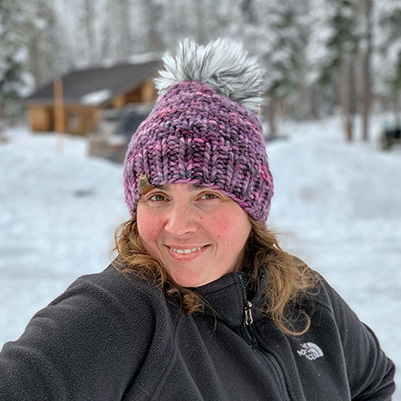 So, after many failed attempts of becoming a consistent Martha Stewart – June Clever hybrid (hahaha… just kidding), I finally found a system that worked and allowed me to be successful. 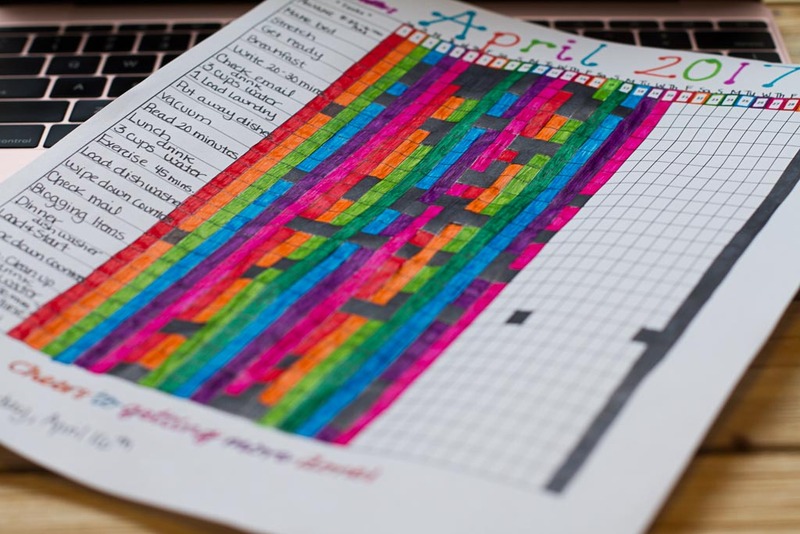 Basically, I made a reasonable list of everything I wanted to accomplish each day and then I put it into a grid chart. 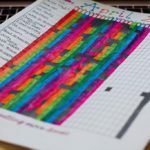 Each day I picked a pen color and as I completed a task, I colored in the box. 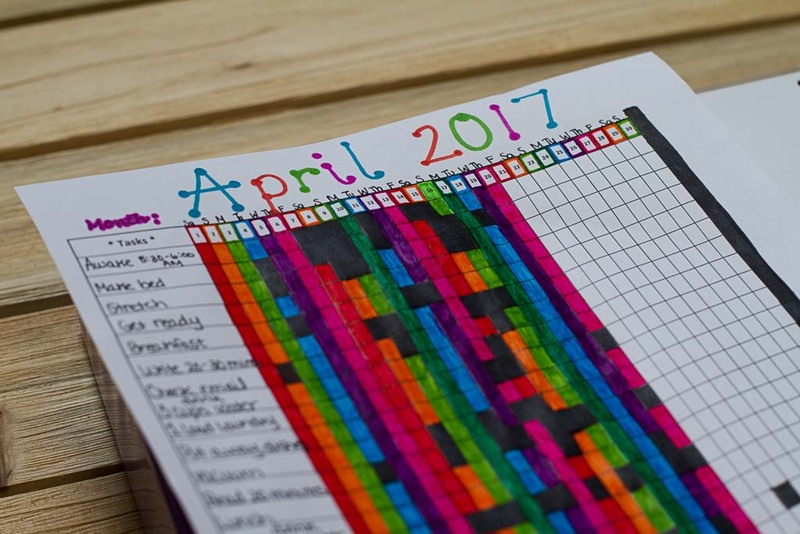 It allowed me to know what I needed to accomplish, plus it gave me an overview of each month. I could see where I was struggling to complete certain tasks, which allowed me to adjust and make another plan of action to allow me to be successful. 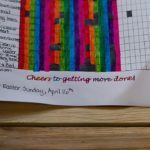 A Chore Chart in Pixels has worked so well for me, that I have started using it in other ways as well. I have one for cleaning the house, one for keeping the kiddos on schedule, and a personal one that I use to track bill paying, date nights, exercise, and personal growth. What I love about this concept is that it is so easy to adjust to what you need to track. I have also included a few pictures below so you can see how I utilize this nifty tool. I used a black sharpie to fill in the boxes for tasks I didn’t complete, making it easy to see areas I need to work on. 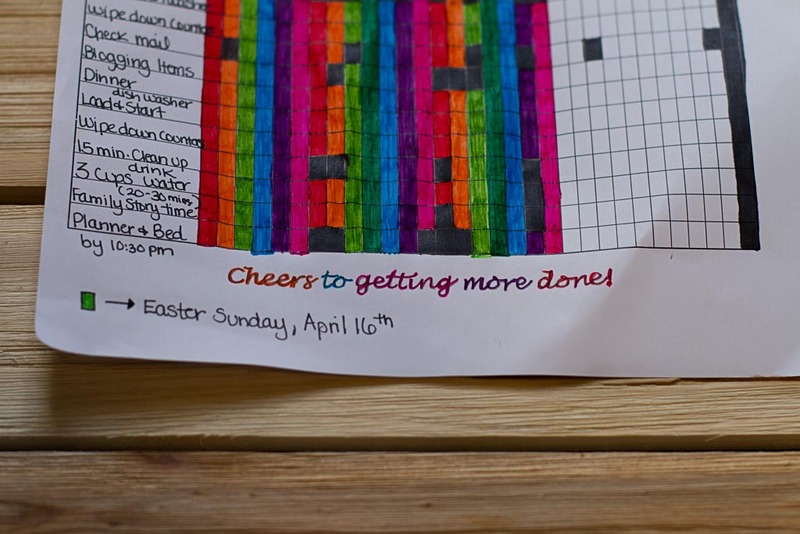 Below is a free Chore Chart in Pixels, so you can simply print it and start tracking today. I hope you find this as fun and useful as I have! Feel free to let me know how it is working for you by commenting below or if you have any questions, feel free to email. Toys! 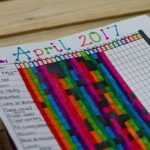 Your kids love them, they can be great learning tools, but how in the world can you organize them? Toy organization can be a huge challenge. Between Christmas, birthdays, and just random gifts, they can pile up quickly. As a parent, I feel so thankful that everyone has given these wonderful gifts to my children which of course makes me want to keep everything, but I know that isn’t reasonable. I’d like to share some things that have worked for my family over the past couple of years to reduce some of the clutter and organize the chaos. I’ve found that it works best to cut back on the number of toys before major events such as birthdays and holidays where gifts might be given. It isn’t a bad idea to reassess after the event either. But what do I give up? Toys that you could consider donating fall into different categories. Has your child obviously outgrown some of his or her toys? I’m thinking of things like jumpers, bouncers, play mats, etc. Once you’re reasonably sure that you won’t be welcoming any more little ones into the family, maybe it is time to pass these on to someone with a need. Maybe you have toys that are constantly problematic. They might have broken parts, frustrate your child, or in some other way cause issues in your household. You probably won’t mind saying goodbye to these toys. Duplicate toys. If certain toys perform the exact same functions or are identical, give one of them away. Should I still hang on to some of those memories though? Of course. There are many reasons to hold on to your children’s toys, long after they are done using them. This one is obvious, but of course the kids’ favorite toys should stay, even if they are outgrowing them in most cases. I’m sure your toddler has something that she just won’t let go, and that’s great. Toys that were handed down to your kids should be treasured. They were worth saving for the next generation at least once, and if they still stand the test of time, hang on to them. Your kids might enjoy giving them to their kids someday. Educational and imaginative toys! This one is big in our household and if the toys promote education, using your imagination, or anything along those lines that helps your child grow and develop, I say be sure to keep these. Sentimental toys. Don’t get rid of these toys. You’ll regret doing so and sometimes toys can serve as a reminder of a wonderful memory. Now that I’ve thrown out some ideas on what to keep, how do I actually organize what I have? Bins, bins, bins. We like to use see-through plastic bins with lids such as these: Sterilite 6-Quart See-Through Latch Box with White Lid to control loose toys. Our kids all get the sets of toys will a million loose pieces – having a dedicated bin for each toy set is invaluable. As the kids get older and you’re trying to teach them to pick up after themselves, put a picture of the contents on the bin so your child knows which bin to place the toys inside. On that topic, some toys come in bins or are somehow self-contained. When given the choice, these can be huge helpers in keeping an organized play area. Bins with lids are nice, but something like this: Tot Tutors Kids’ Toy Storage Organizer with 12 Plastic Bins can work well too. In lieu of a built-in solution, a storage system can meet a lot of the demands for storing your kids’ toys. Put toys that aren’t played with quite as often in a storage area and then getting them out can be a special event. If you have lots of stuffed animals, get a net like this: Jumbo Toy Hammock – 2 PACK It allows you to display them but get them off of the floor until your child is ready to play. If your child is old enough, have them participate in the cleanup process – maybe they will start to clean up on their own as they get older (wishful thinking?). If you have a core group of friends, you could consider “sharing” toys with them – pass down toys that your kids might have outgrown, then when they are done and you have another kid, they can pass them back. When a group of friends does this, it can really help out. 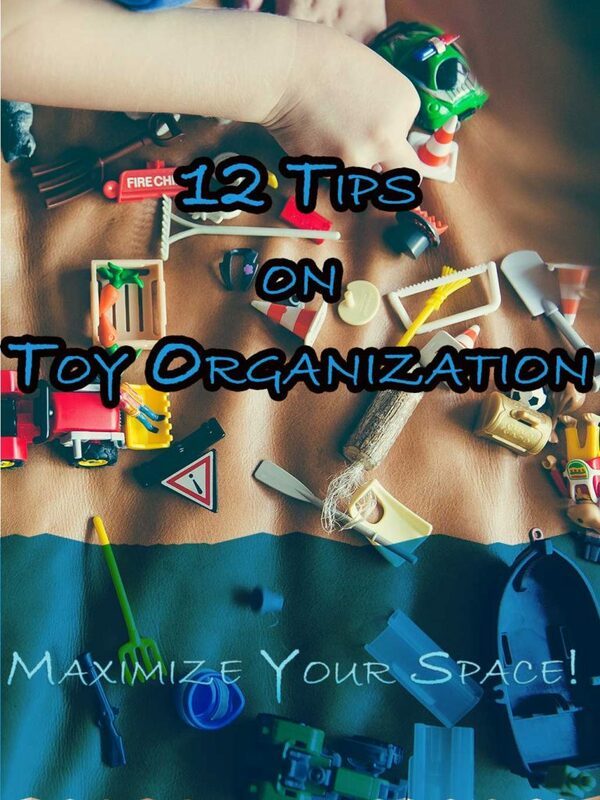 I hope you’ve enjoyed the article, that this helps you with your toy organization, and as always, I’d love to hear your great ideas! Feel free to comment below and if you’d like to get future updates from my site, please subscribe.